Hello and welcome to Tool Time Tuesday. For the next few weeks or more, I am going to gear these TTT posts towards Christmas...maybe do some decorating posts or maybe gift giving ideas. I know it may seem early, but we all know those nights of making or decorating at the last minute. So why don't you join me in doing one or two crafts a week, so you can actually enjoy the holidays without all the rushing around. 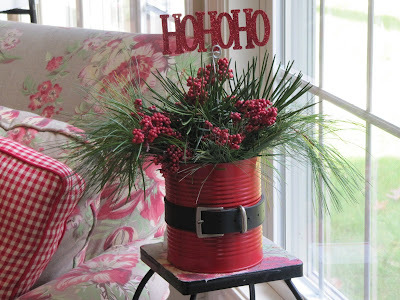 Here is the first project for the holidays....A Santa Can. Make one this week for yourself and then make another one for gift giving. It's perfect and practically FREE! Do you remember the post I did showing flower arrangements for a school fundraiser. 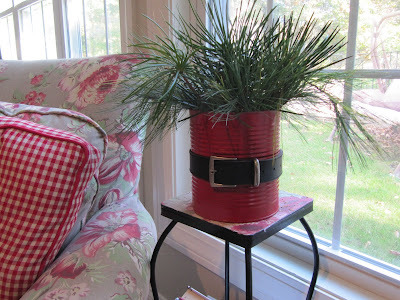 I went to local restaurants and pizza places and asked them for their large metal cans that tomatoes come in. They were happy to give them to me for free. They are the big ones...7 inches high and 6 inches across at the top. Here are some ideas for Santa's black belt. 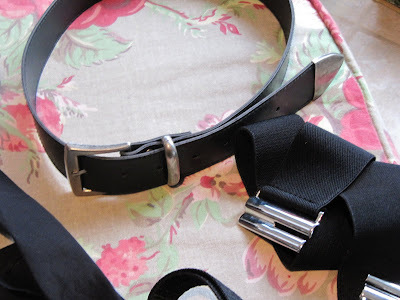 Old leather belts that don't fit any more (I don't want to talk about the not fitting part) or elastic belts that you can adjust to fit. How about an old strap from a camera or bag that you aren't using any more. You can also cut black fabric and fold the raw edges into the middle...no sewing! You can also use trim, satin ribbon or ric rac too. If you aren't using an actual belt, you'll need a buckle. 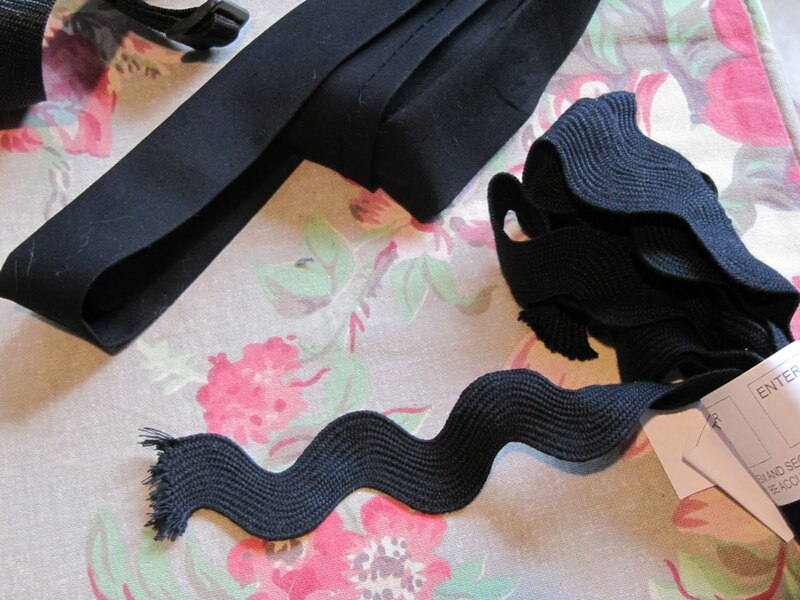 You can cut one off an old belt or use 2 D rings. D rings are the things you find on a belt most of the time made with ribbon or a scarf. Another idea to make a shiny belt buckle is to cut open a soda can, trace a template of a buckle on the inside metal and cut it out with tin snips. 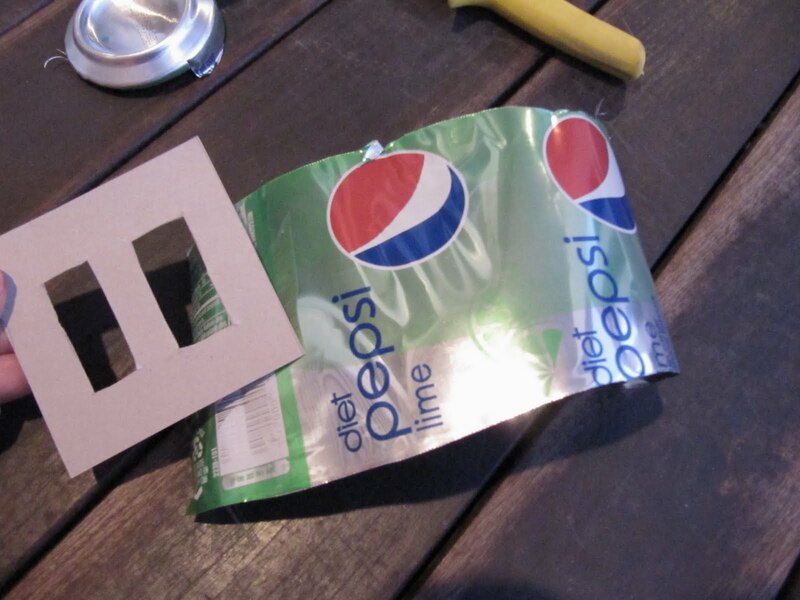 Actually, the can is so soft, I cut it with a small pair of scissors. Just find a picture of a buckle and draw it out on card board. 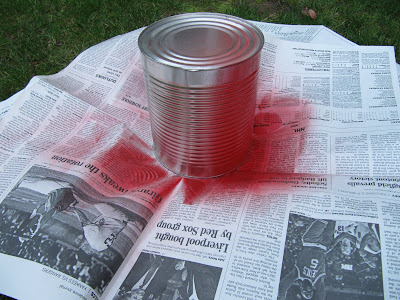 Then trace it on the inside of the can. The next step is to spray the can. I sprayed it upside down so the paint won't get inside the can. a place to hold all the Christmas cards you receive over the holidays. 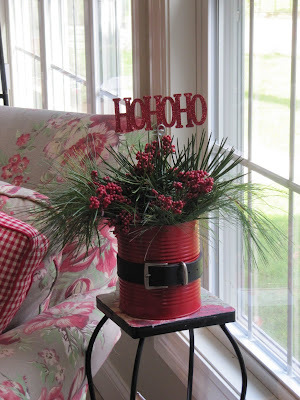 Add some evergreens cut fresh from outside for the scent of the holidays. Add some berries for a beautiful centerpiece. These were some fake berries I already had, but real ones from your yard would be beautiful too. Then add a little HO HO HO sign for the perfect greeting at your front door. I bought this sign after Christmas for 10 cents. You can easily make one by printing the words out on your computer, tracing it on cardboard...a little paint and glitter and you're done! 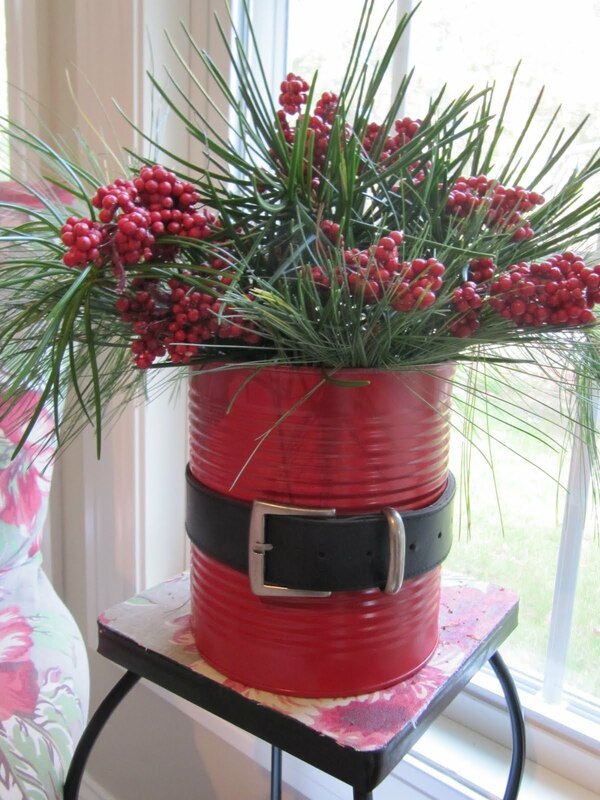 These large cans would be great for centerpieces, but wouldn't a little vegetable can or those tiny tomato paste cans be cute decorated the same way, but used for place card holders at the dinner table. Ohh, I need to make one of those!! I'll show you if I do! Add that to the list of "To Do's"
I'm thinking of 2 words...CUTE and CHEAP! Love this! 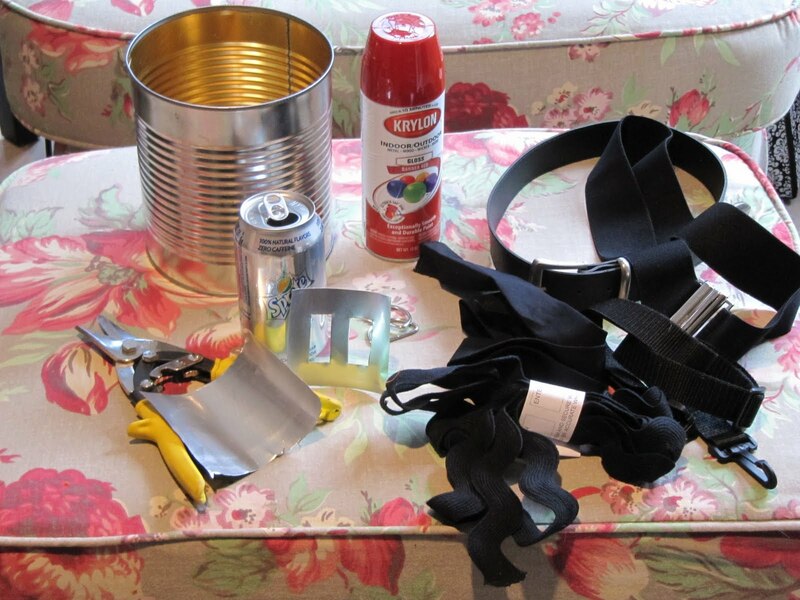 Stupid question: If you're using an actual belt, how do you best finish it to fit the can? Che bello, semplice, carino e quasi gratis!!!! Love it...I think this may be the perfect gifts for some really amazing neighbors. They will be thanking YOU. I love this idea Karen, cute as heck. I'll bet you'll have those place card cans done tomorrow, LOL. Yes, a great idea. On my list to do!!!!! That is great! 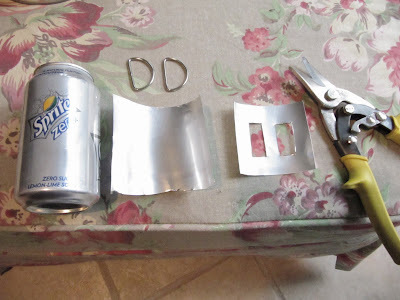 Love the tip for making a belt buckle from an old soft drink can, that is clever. You really do have some fab ideas Karen. What a fabulous idea! Thanbks for sharing your creativity each week! I'm going to remember this project for Xmas; I love it! Thanks for the inspiration!! even a soup can for someone's desk at work would be a cute idea to bring a smile or two. 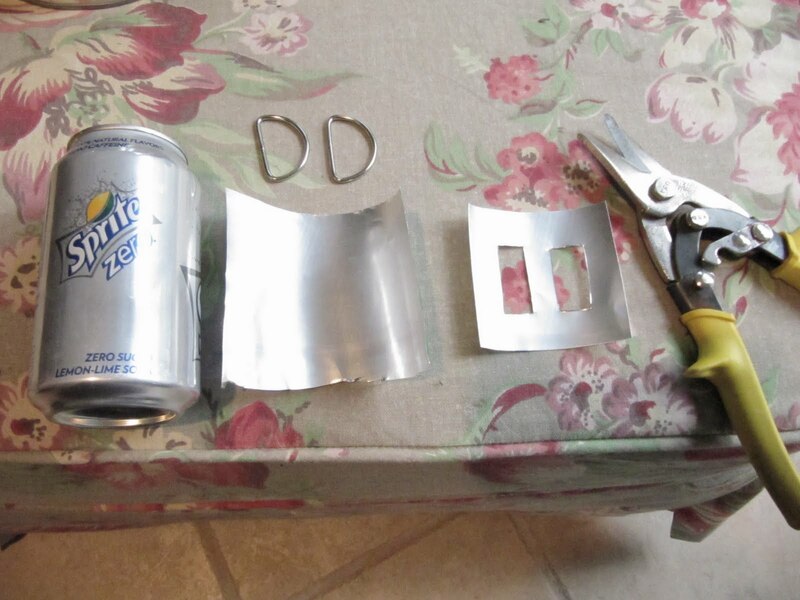 I used to make votive holders from soup cans too by punching holes with an al (or even a nail) in a soup can with any design (usually a house with a tree or star or anything really) spray the can and slip a votive in and there you go, atmosphere in a can... Great way to light up a front walkway for wintery nights with a few guests. What a great idea!! Now to go beg used cans! LOL! How cute is that. Great idea. What a cute idea! It's on my list of things to do.Thank you! It just amazes me that you can take such a simple thing (ie a can) and make it into something so very attractive! Simple but adorable. This is adorable, and I work at a restaurant so I have access to lots of those cans. Thanks! Now that is a cute idea. Wouldn't that be fun to take to someone in a nursing home or who is ill and confined?? Great idea Karen! Cute idea! This will be a great addition to the decorations on my porch. Thanks! Gorgeous,gorgeous,gorgeous and YES very inexpensive!!! around the top and bottom too. Very cute and simple...love it! I can see that the holidays are so fun around your home. Just love this. Maybe I will be in the US by then? Maybe??? Thank you so much! Really, you don't know how much this means to me. I've been struggling and decided I needed to make some changes and a focus for me is the home. But I don't have a lot of extra money so any idea like this is perfect for me. It is giving me so much encouragement. I can't wait for the next idea. Truly, I can't say thank you enough. And I'm making this soon. Very cute! 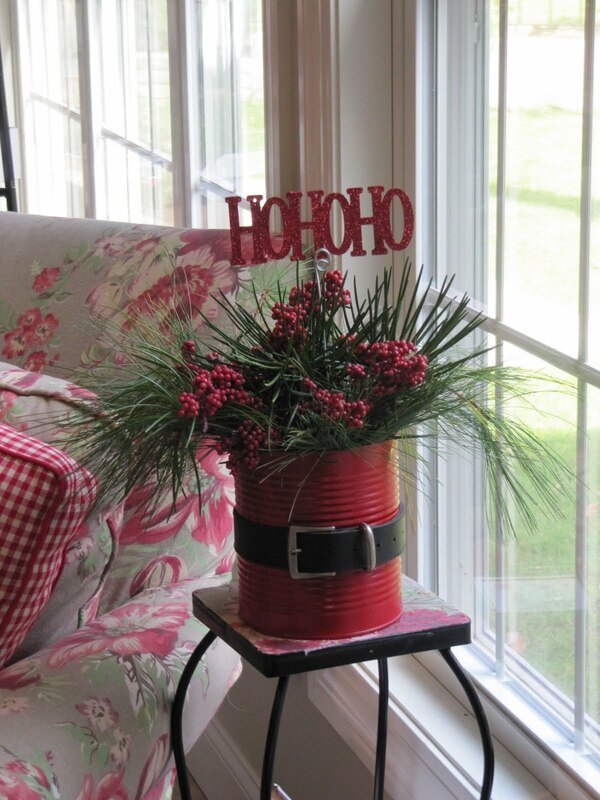 This would make great gifts for the neighbors too, maybe with cookies or a mini-tree inside. I was thinking the same thing. It could be a great base for a gift basket-y gift. Put your stuff inside and wrap! How fun is that! Thanks for the great idea! I love this idea! I will definitely try this! 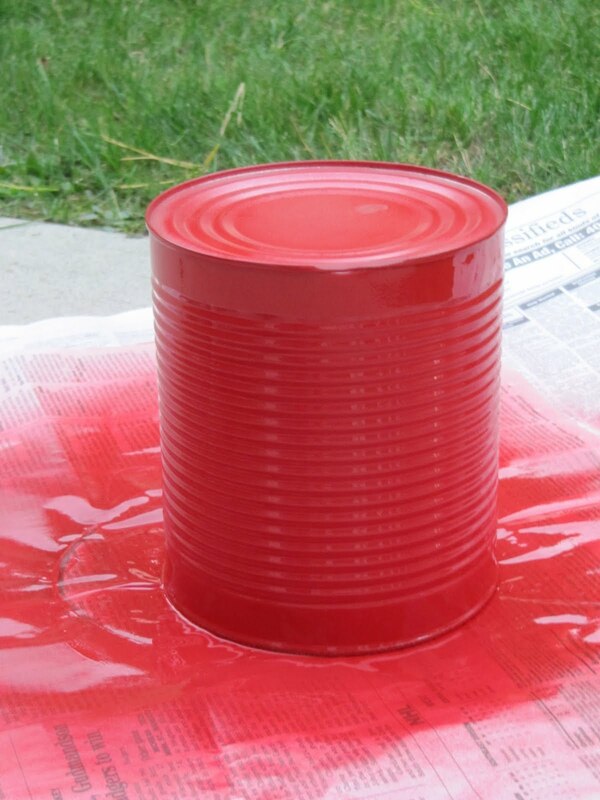 If you don't have any large cans, you can also buy empty quart or gallon paint cans at Home Depot for a couple of dollars. Thanks, Karen!! I love this idea and I have access to lots of those cans! Oh my goodness that is so cute.... and thank you for the blog tips.. I can't wait for the next one. Wow Karen! Oh to be a visitor in your imaginitive mind for a day! There must be so many parties going on - and they're all FUN!!! Ho ho.. I mean "Hugs"!!! Now this is something even I could pull off! Great idea! Girl, you are a blessing, you know that? Thank you for such a lovely idea. I now have a splendid holiday gift for the teachers at school! Yippee! That is a brilliant idea! I hope you won't mind if a put a link to this idea on my Christmas blog. I look forward to seeing what Christmas brilliance you come up with next time! I LOVE this! So creative! 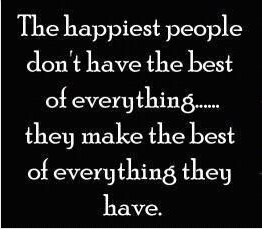 and I already have everything on hand! completely adorable! LOVE< LOVE> LOVE> it! I have a round red cookie plate with a Santa belt across~ one of my favorites. This is so stinkin creative, I love it! Showed my husband(Christmas nut) he likes it too! 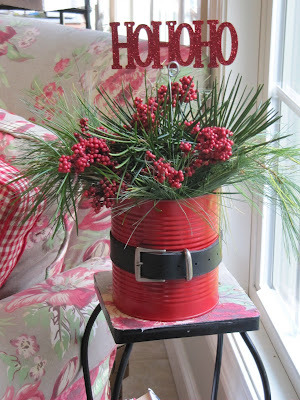 LOVE your santa can and the name of you blog :) come on over and link up to MMM ! This is ABSOLUTELY adorable!! I'll definitely be linking! I am sorry to say I have lost track of Tool Time Tues. lately but am making a note to get back on track. You outdo yourself time after time - I love this idea ! Be such a cute hostess gift. Just came across your site and love it! You are so creative. After seeing your place card holders, I was wishing I was hosting the xmas party this year. Just saw this on Pinterest! LOVE THS IDEA!!!! This is really cute and appears to be real easy to make. Great gift idea. Thanks for sharing. Probably won't get made this year, maybe for next. That can is just too cute. Thank you for this idea! I made ten (yes 10!!) for the tables at a church Christmas luncheon. Got the cans at a local pizza restaurant. The "HOHOHO"s were cut out of red foam, sprayed and glittered. 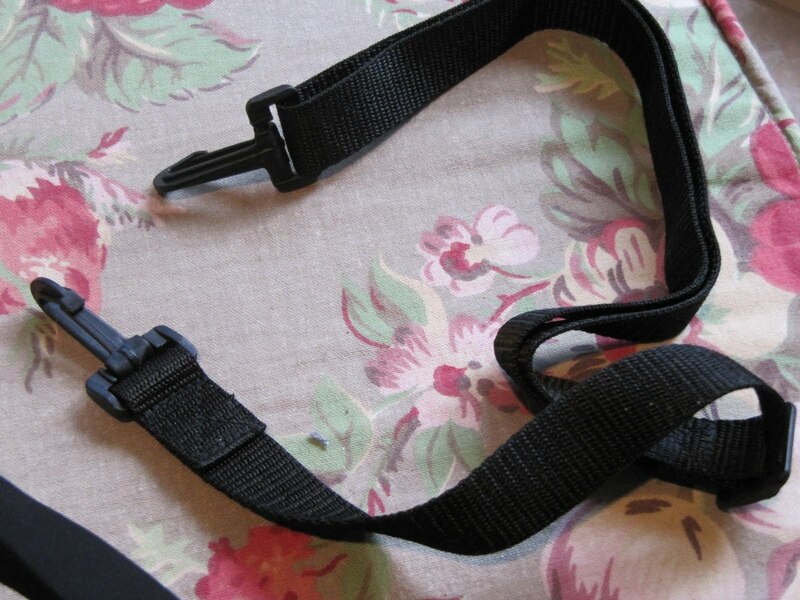 Five inch strips of a leather like material were folded length wise in thirds for the belt . The buckles were made made from silver glittered foam. 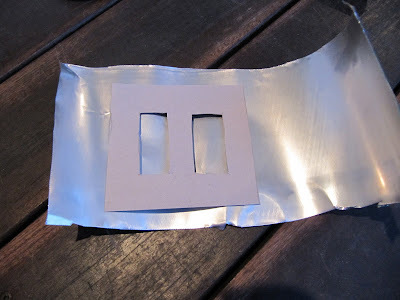 The foam for the letters and the buckles was from Michaels and VERY easy to cut with small scissors. We sold the centerpieces for $15 a piece after the lucnheon. Just found this on pinterest -- Great idea and great photos. Great job, I can't wait to see what else you come up with! 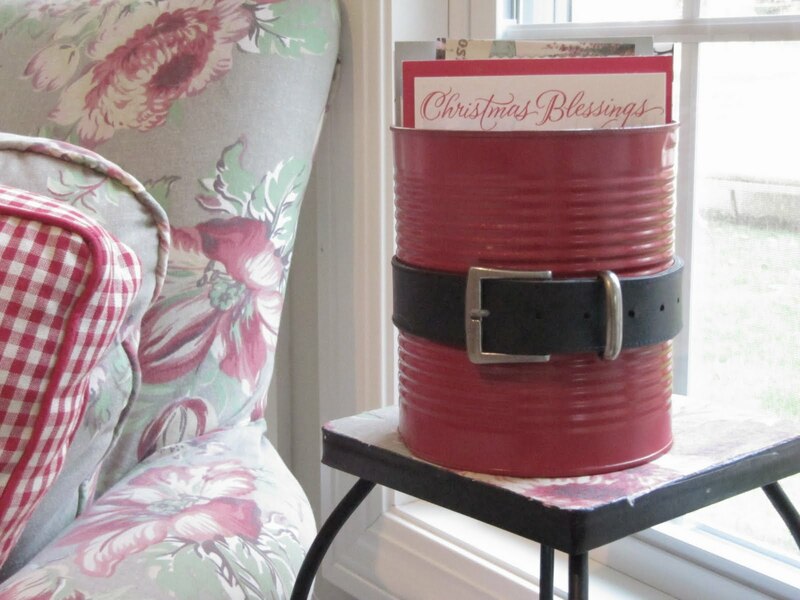 You could do a mini version with soup cans also and put candy canes and Christmas pencils in it for a cute teachers gift.